Song is a buzzy, falling “fee-beo”. Also “wee-bee” but not sneezy. Description: Sexes similar. Olive-brown above; whitish throat; light undersides; two light wing bars; and light eye ring. Almost indistinguishable from Willow Flycatcher, but the eye ring is usually bolder, upperparts are slightly greener, and the bill is slightly shorter. 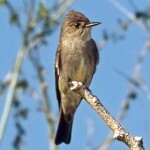 Migrants can be found in shrubbery and small trees near grassland openings and water. Generally found in forested areas while breeding. 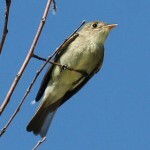 Where in Nebraska: Fairly common regular spring migrant east and rare casual central. Rare casual fall migrant east. 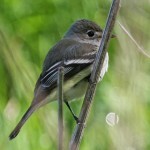 Field Notes: Alder and Willow Flycatchers are so similar that they were once considered to be the same species. 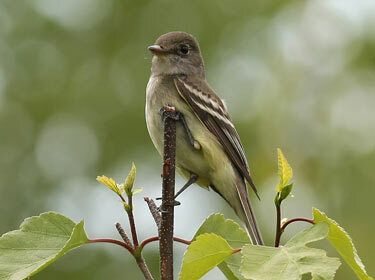 Fun Facts: The Alder Flycatcher is so similar to the Willow Flycatcher that they were throught to be the same species. The song is the only definitive way to tell them apart.